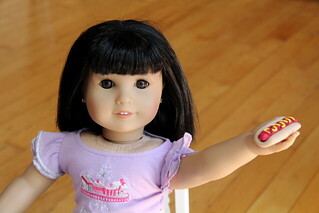 mommy bytes: American Girl Dolls Need to Eat Too! 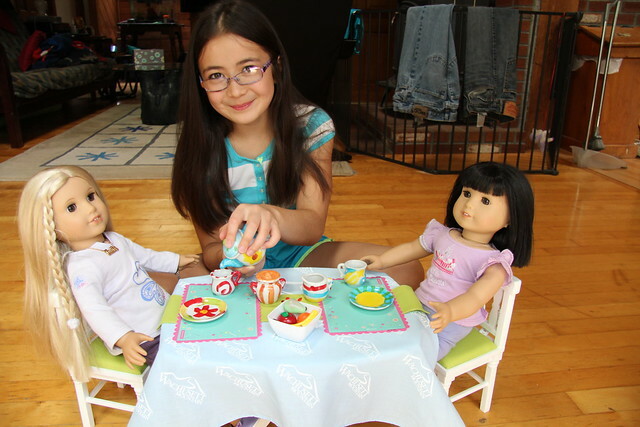 American Girl Dolls Need to Eat Too! A few years ago, when Dova was still in her American Girl Doll phase (or craze), I purchased these holidays gifts for her to encourage "creative play". 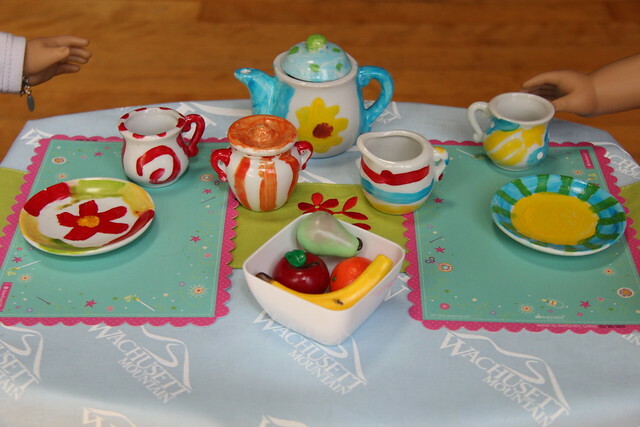 Of course, I was completely remiss because how can you use a tea set and party plates without proper play food? You can't just "imagine" food like we did as kids. We had already given away our beloved set of wooden sandwiches from when the kids were little. Even if we still had it, Dova said it would be too big anyway. What did I know? 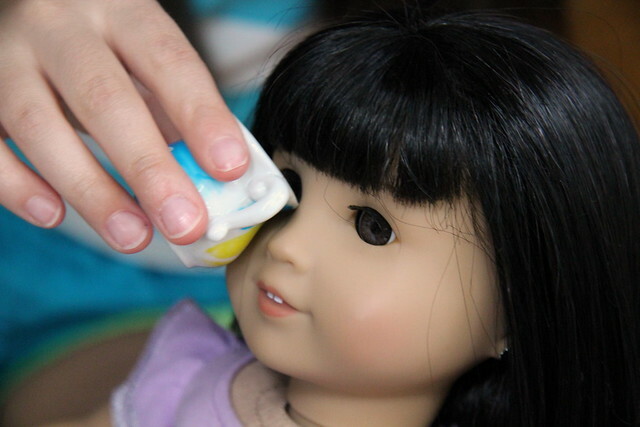 You must only use correctly scaled (1:3 for AG dolls, which would make the girls 4'6" in real life), age-appropriate play food. Creative play is not about creatively using the resources you already have, it's about buying more and more stuff! Geesh! At the time, you couldn't order it online, and I searched in the store to no avail. She was very unhappy! Have I mentioned that Dova is extremely demanding and difficult? This was back when she only had an iPod Touch which I thought would provide a "convenient" way to communicate. It mostly provides a convenient way for her to YELL AT ME IN ALL CAPS. Since we couldn't purchase the cheap plastic food, I went to Etsy and eventually to Katie's Craftations for beautifully hand crafted food! We spent a bit more money, but ended up with delicious-looking, long-lasting one of a kind items. 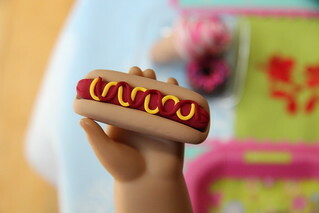 How can you resist this hot dog which fits perfectly in Ivy's hand? 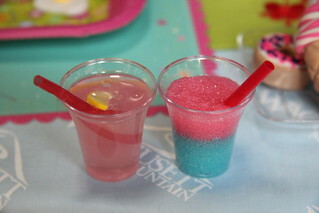 Or these incredible drinks? 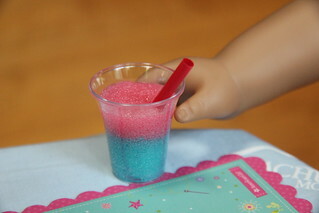 I bet you want a pink lemonade or a slushie now! 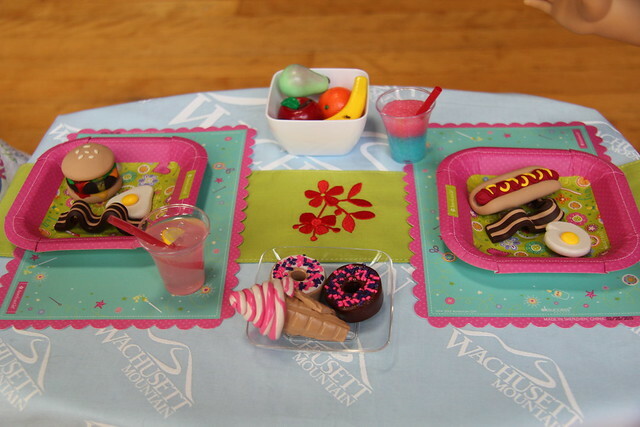 Here's a proper brunch for dolls. Don't try to eat the donut yourself! 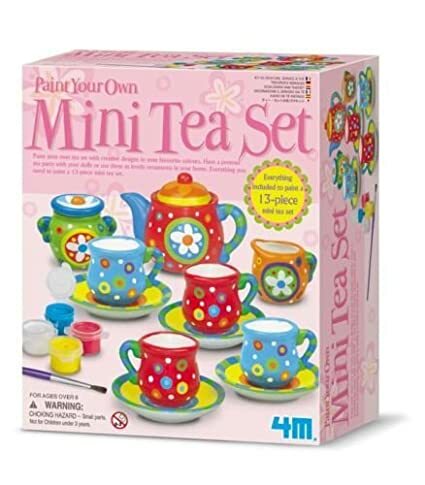 Dova did paint the tea set. Here it is with some healthier fruit snacks. Of course all this "proper" play is no fun. This photo sessions soon devolved into an eye cup for Ivy, or "I CUP", which when spelling out the letters is, "I see you pee". This soon turned into real ROFL, rolling on the floor laughing! 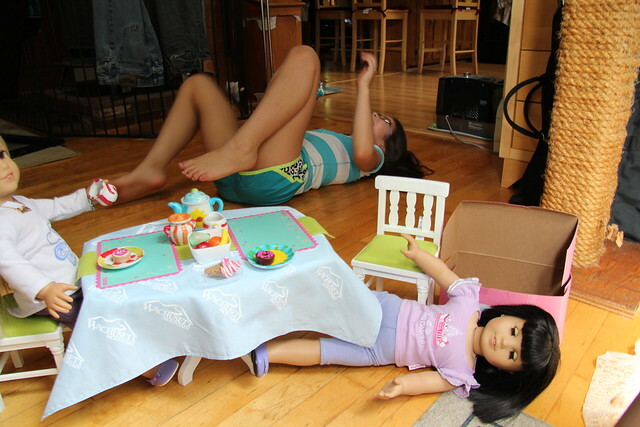 The days of doll tea parties have gone by the wayside, but the food still shows up in unexpected places. Here's a recent Video Star video, "I Heart Hand Signs" where the banana makes an entrance. 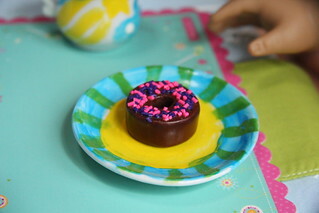 If you want fantastic doll food, head over to Katie's Craftations! This post was not sponsored in any way, but feel free to purchase the other items through the Amazon affiliate links :).